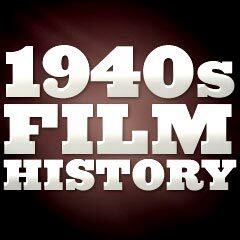 The early years of the 40s decade were not promising for the American film industry, especially following the late 1941 attack on Pearl Harbor by the Japanese, and the resultant loss of foreign markets. However, Hollywood film production rebounded and reached its profitable peak of efficiency during the years 1943 to 1946 - a full decade and more after the rise of sound film production, now that the technical challenges of the early 30s sound era were far behind. Advances in film technology (sound recording, lighting, special effects, cinematography and use of color) meant that films were more watchable and 'modern'. Following the end of the war, Hollywood's most profitable year in the decade was 1946, with all-time highs recorded for theatre attendance. 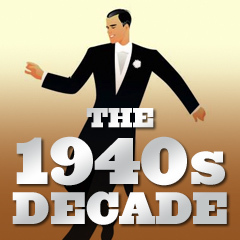 The world was headed toward rearmament and warfare in the early to mid-1940s, and the movie industry, like every other aspect of life, responded to the national war effort by making movies, producing many war-time favorites, and having stars (and film industry employees) enlist or report for duty. The US government's Office of War Information (OWI), formed in 1942, served as an important propaganda agency during World War II, and coordinated its efforts with the film industry to record and photograph the nation's war-time activities. Tinseltown aided in the defensive mobilization, whether as combatants, propagandists, documentary, newsreel or short film-makers, educators, fund-raisers for relief funds or war bonds, entertainers, or morale-boosters. Films took on a more realistic rather than escapist tone, as they had done during the Depression years of the 30s. Hollywood Canteen (1944), the West Coast's answer to Broadway's Stage Door Canteen (1943), was typical of star-studded, plotless, patriotic extravaganzas, one of several during the war years which featured big stars who entertained the troops. [Originally, the Hollywood Canteen was a nightclub for off-duty servicemen, founded in 1942 by movie stars Bette Davis, John Garfield, and others. It provided free meals and entertainment, and was located at 1451 Cahuenga Boulevard, off Sunset Boulevard.] Big name stars and directors either enlisted, performed before soldiers at military bases, or in other ways contributed to the war mobilization. Many of the leading stars and directors in motion pictures joined the service or were called to duty - Clark Gable, James Stewart, William Wyler, and Frank Capra to name a few, and male actors were definitely in short supply. Rationing, blackouts, shortages and other wartime restrictions also had their effects on US film-makers, who were forced to cut back on set construction and on-location shoots. A new breed of stars that arose during the war years included Van Johnson, Alan Ladd, and gorgeous GI pin-up queens Betty Grable and Rita Hayworth. (Betty Grable had signed with 20th Century Fox in 1940 and would soon became a major star of their musicals in the 1940s.) Some of Hollywood's best directors, John Ford, Frank Capra, John Huston and William Wyler, made Signal Corps documentaries or training films to aid the war effort, such as Frank Capra's Why We Fight (1942-1945) documentary series (the first film in the series, Prelude to War was released in 1943), Ford's December 7th: The Movie (1991) (finally released after being banned by the US government for 50 years) and the first popular documentary of the war titled The Battle of Midway (1942), Huston's documentaries Report From the Aleutians (1943) and The Battle of San Pietro (1945), and Wyler's sobering Air Force documentary Memphis Belle: A Story of a Flying Fortress (1944). The most subtle of all wartime propaganda films was the romantic story of self-sacrifice and heroicism in Michael Curtiz' archetypal 40s studio film Casablanca (1942). It told about a disillusioned nightclub owner (Humphrey Bogart) and a former lover (Ingrid Bergman) separated by WWII in Paris. With a limited release in late 1942 (and wider release in 1943), the resonant film was a timeless, beloved black and white work originally based on an unproduced play entitled Everybody Comes to Rick's. The quintessential 40s film is best remembered its superior script, for piano-player Dooley Wilson's singing of As Time Goes By, and memorable lines of dialogue such as: "Round up the usual suspects" and Bogart's "Here's looking at you, kid." Its success (it was awarded Best Picture, Best Director, and Best Screenplay) made Humphrey Bogart a major star, although his character reflected American neutrality with the famous line: "I stick my neck out for nobody." The 40s also offered escapist entertainment, reassurance, and patriotic themes, such as William Wyler's war-time film Mrs. Miniver (1942), starring Walter Pidgeon and Oscar-winning courageous heroine Greer Garson as husband and wife. It was a moving tribute and account of courageous war-besieged Britishers reliving the trauma of Dunkirk and coping with the war's dangers in a village. Alfred Hitchcock, who had recently migrated to the US, directed Foreign Correspondent (1940), ending it with a plea to the US to recognize the Nazi menace in Europe and end its isolationist stance. A variety of war-time films, with a wide range of subjects and tones, presented both the flag-waving heroics and action of the war as well as the realistic, every-day boredom and brutal misery of the experience: Dive Bomber (1941), A Yank in the R.A.F. (1941), Wake Island (1942), Guadalcanal Diary (1943), Bataan (1943), Winged Victory (1944), and Objective, Burma! (1945). Warner Bros.' Sergeant York (1941), directed by Howard Hawks, was typical of Hollywood offerings about the military - the story of a pacifist backwoods farmboy (Best Actor-winning Gary Cooper) who became the greatest US hero of World War I by single-handedly killing 25 and capturing 132 of the enemy. Thirty Seconds Over Tokyo (1944) (featuring a US bomber named Ruptured Duck) starred Spencer Tracy as Lieut. Col. James Doolittle who carried out the first US bombing raid on Japan. William Wellman's The Story of G.I. Joe (1945) - immortalized WWII Pulitzer Prize-winning combat correspondent Ernie Pyle (Burgess Meredith) and his experiences with the men of Company C of the 18th Infantry and their role in the invasion of Italy, John Ford's They Were Expendable (1945) with star John Wayne in a story about the Pacific Ocean's PT boats, Delmer Daves' Destination Tokyo (1943), Zoltan Korda's exciting epic Sahara (1943) (with Humphrey Bogart as heroic desert tank driver Sgt. Gunn), and Lewis Milestone's intense, unglamorous war films of struggle, resistance, and occupation: Edge of Darkness (1943), The North Star (1943), The Purple Heart (1944) and the excellent A Walk in the Sun (1945). British director Michael Powell and Oscar-winning scriptwriter Emeric Pressburger joined forces for the war drama 49th Parallel (1941), the war adventure One of Our Aircraft is Missing (1941), and the superb character study classic The Life and Death of Colonel Blimp (1943). The Royal Navy (and Lord Mountbatten) was paid tribute in writer/co-director and star Noel Coward's WW II drama In Which We Serve (1942), co-directed with David Lean in his first directorial effort. It was the most celebrated and patriotic British war film of the era. Director Carol Reed's pseudo-war documentary The Way Ahead (1944) followed the training of soldiers to fight against Rommel's Afrika Korps. Since You Went Away (1944) was the American homefront version of 1942's biggest hit film, Mrs. Miniver (1942) about the perserverance of a British middle-class family during the Blitz. George Stevens' The More the Merrier (1943) reflected the housing shortage in the nation's capital city during the war years. This is the Army (1943), a 'show-within-a-show' account of Irving Berlin's Broadway stage revue, introduced Kate Smith singing the patriotic song God Bless America - the US' alternate national anthem. After the war, William Wyler directed a provocative, dramatic Best Picture-winning film about the plight of three returning G.I. veterans (Dana Andrews, Fredric March, and Harold Russell) to the homefront. The multi-Oscar winning picture The Best Years of Our Lives (1946) was produced by Samuel Goldwyn and photographed by Gregg Toland. Non-professional, disabled veteran Harold Russell won a Best Supporting Actor Oscar for his role in the film. In two of the film's memorable scenes, Hoagy Carmichael taught double-amputee Russell to play Chopsticks on the piano, and Russell displayed his vulnerabilities to his fiancee (Cathy O'Donnell). Lightening up the wartime mood was Cary Grant who portrayed Captain Henri Rochard, a French soldier in Howard Hawks' gender-bending farcical comedy I Was a Male War Bride (1949), who was obliged to dress as a woman to marry an American female soldier (Ann Sheridan).